How Can Office Screens Help Acoustics in the Workplace? At XL Displays, we have the UK's most complete range of office partition screens with prices starting from £55 with just a 24-hour dispatch; but how well can office screens truly help acoustics in the workplace? There are numerous ways that sound can be minimised to help your busy workers concentrate. Research shows that noise in offices can distract workers and reduce productivity and accuracy of work. Introducing office screens to a workplace can help reduce sound by either blocking or absorbing it. The best quality screens, such as our Premium Acoustic Office Screen range, do both. You may also opt for our ECO Acoustic office screens which is built to reduce noise pollution. In this range we offer straight screens, wave screens and office desktop screens. They are 35mm thick and covered both sides with a pinboard layer and foam-backed, woven fabric. This combination of materials and construction gives the screens good acoustic qualities. All our partition screens can be joined to others in the same range. Each screen includes two linking strips - one for linking in a straight line and one for linking at a 90o angle. Hard surfaces will reflect and potentially amplify sound and increase reverberation times. Introducing soft surfaces to an area will absorb sound. Generally, the softer the material, the better its absorption capabilities. Our acoustic office partitions are covered in thick, sound absorbing foam with a top layer of woven fabric to maximise sound absorption. Office screens act as a sound barrier. Most office sound from people is emitted at desk at sitting head height – between 750mm and 1200mm above floor level. The average of these heights is 975mm. An office screen that is 1800mm high would be 825mm above the average sound source whereas a 1200mm screen would be 225mm above the sound source. Therefore, an 1800mm high screen is, on average, three times more effective than a 1200mm screen. 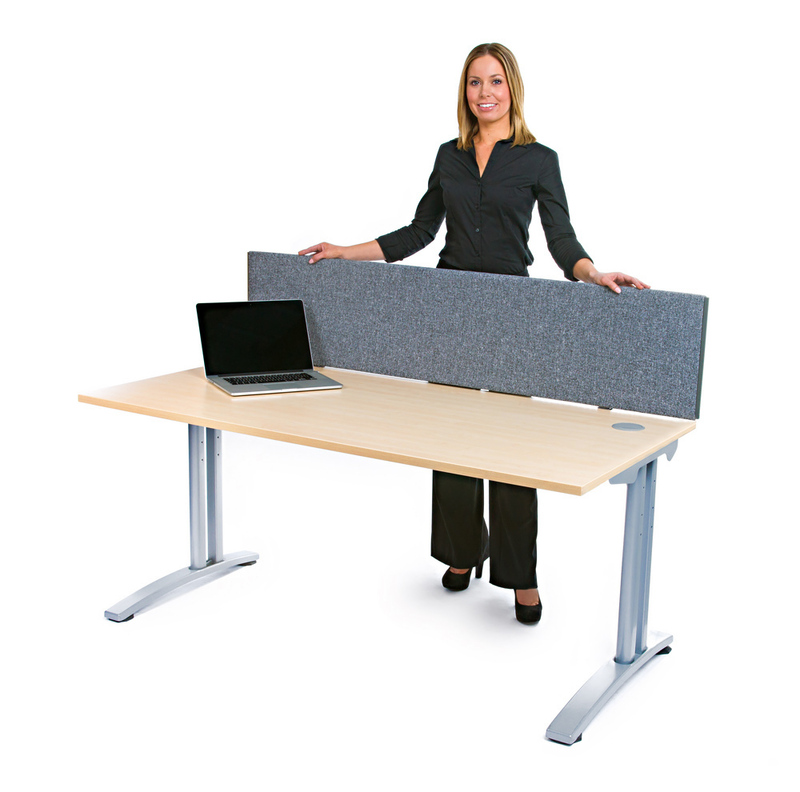 Our Premium Acoustic office dividers are 62mm thick, with a large void in the middle between the surfaces. To reduce sound travelling through something you need to increase the distance between the two surfaces. This void along with the materials used, including 12mm thick outer layers and thick sound absorbing foam, makes them our best acoustic office screens. They come in a range of sizes – the highest being 2100mm and the widest being 1800mm, so they are large enough to act as an effective sound barrier. XL Displays sells a wide range of office desktop screens and office partitions designed to help reduce noise in the workplace. They are easy to order online so to find out more and view our office partition screens, visit our office desktop screen range. Do you require something a bit different or to a bespoke size? Please call our sales team on 01733 511030 who will be more than happy to help or Contact Us.